Twitter slams United Airlines for brutal video of passenger dragged off plane. On Monday, disturbing footage of a doctor being violently dragged from an United airplane surfaced on social media, causing a tidal wave of backlash for the airline. According to CBC News, United forced the man off the plane against his will after he was one of four people randomly selected to forfeit their seat so airline employees could fly. When the doctor refused to deplane, explaining that he had patients waiting for him, law enforcement was called to remove him from the aircraft. In the process, the man was bloodied and literally dragged away. Warning, the videos are disturbing. Of course, Twitter was outraged by the cruel and violent mistreatment of the man, and had no qualms about dragging United for filth over social media. Here are 30 of Twitter's best reactions. For your safety, United will now begin doling out unbridled carnage by group number. Passengers with small children can request to be maced. Can't wait for the headline next week "United Airlines Flight Attendant Ordered To Murder A Child Because She Asked To See The Cockpit"
"I have had it with these motherf*cking people on this motherf*cking plane!!!!"
. @united can you send your people to get me out of bed? So @united is like the Hunger Games of flights when they overbook. UNITED: Leggings are a breach of decorum. ALSO UNITED: We will beat you and drag you from the plane if we want your seat for our employee. Ironically, not enough seats in the conference room where United is having its crisis meeting. People who are afraid of flying are generally more scared of the plane than the staff but United is changing all that. United- WE ARE THROWING YOU OFF THIS PLANE! Doctor- But I paid 4 this! United- Did anyone steal a seat? Thought I was at a UFC fight last night but I was just flyin' United. 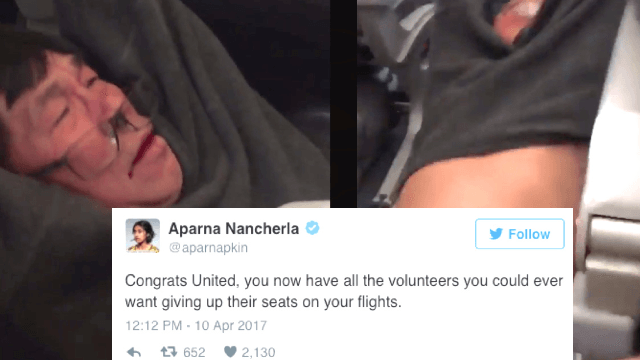 Congrats United, you now have all the volunteers you could ever want giving up their seats on your flights.